Retailers in Wales say they hope the impending VAT rise will bring bargain hunters into stores to snap up "big ticket" items. The post-Christmas sales season began saw queues from 0230 GMT in Wrexham and about 150,000 visitors to St David's shopping centre in Cardiff. Value Added Tax (VAT) will go up from 17.5% to 20% on 4 January, adding some £10 to items already priced at £500. Retailers hope for strong sales after bad weather before Christmas. Retailers said they hoped the extra VAT would prompt those who were planning to buy larger items to make the purchase in the next few days. David Hughes-Lewis, chairman of Cardiff Retail Partnership, who runs an independent jewellery store, said: "Anyone thinking of buying an expensive piece of merchandise should try and buy it this week. "I'm hoping that anyone shopping for a big ticket item will buy in the next few days." Steven Madeley, director of the St David's shopping centre in Cardiff, said: "If people weren't thinking about the VAT rise before Christmas, they definitely are now and we are seeing more high value items being bought before the rise comes into effect." The centre said 150,000 people passed through its doors when sales began on Boxing Day, making it as busy as one of its busier weekdays before Christmas. 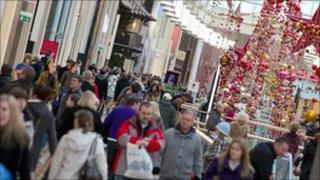 Retailers reported sales had picked up directly before Christmas after bad weather had previously deterred some shoppers. Cath Letton, marketing manager at the McArthurGlen Designer Outlet at Bridgend, said takings in the week before Christmas were 3% up on last year and footfall was up 4% on last year, with nearly 79,000 visitors. Both Ms Letton and Mr Madeley said they expected trading to be busy on Tuesday, the second Christmas bank holiday. McArthurGlen is opening until 2000 GMT, two hours later than its usual bank holiday opening time. Sales that began on Boxing Day had to be held within Sunday trading hours, limiting stores to opening for no more than six hours. Some 500 people queued from 0230 GMT on Bank Holiday Monday outside the Next store at Eagles Meadow shopping centre, Wrexham.